Welcome to Unicorn. Unicorn is a Non-Profit organization located in Pennington, Hopewell Township NJ. Goals of Unicorn include providing equine-assisted activities to children and adults with a wide range of capabilities. Our population includes children and adults with physical, cognitive and/or emotional disabilities. We strive to teach our students equestrian skills which will allow them to be as independent as possible. From a therapeutic perspective, we use horseback riding as a modality to facilitate specific treatment objectives. 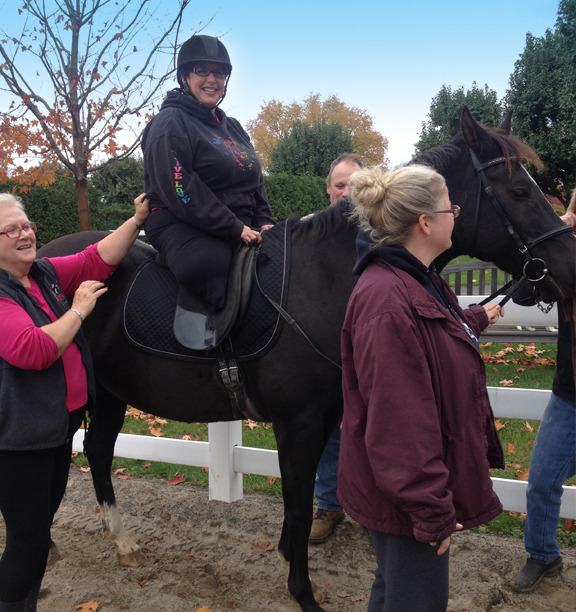 Adaptive riding lessons use modified teaching strategies and/or equipment to help riders learn riding and horsemanship skills through instruction from certified instructors. Riders are assisted by horse handlers as necessary with the goal of becoming as independent as possible. An equine assisted program designed for individuals dealing with cancer. Many cancer patients feel the need for activities that help remove them from the stress of the cancer treatment process. Horses don’t judge and are powerful in their listening abilities! Healing through horses is based upon a model that forms a support network. Schools and organizations that have participated in Unicorn in the past include YALE, Bancroft, ARC of Burlington County and Burlington Day Training School. Occupational Therapy students participate in fieldwork opportunities at Unicorn. Current clinical fieldwork programs include students from Thomas Jefferson University and most recently Rutgers Occupational Therapy Assistant program. Unicorn welcomes OT students!